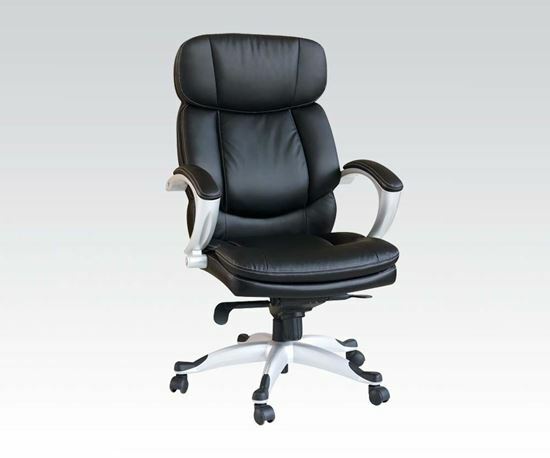 Black Bycast PU Pneumatic Lift Office Chair Furnish your office in comfort and style with this beautiful Black Bycast PU Pneumatic Lift Office Chair. This attractive office chair is perfect for any office setting. The executive chair boasts Bicast leather and 360 degree turning. This office furniture features a pneumatic lift for adjustability, a five caster wheels for easy movement and the arm rests for relaxing. Comfort, style and quality were combined to create this match. Finally, you can add this leather office chair to your office at a discount price without sacrificing quality. Give your office the comfort it deserve with this match. Copyright © 2019 Natalie Décor™. All rights reserved.